Tank Details: 80 U.S. gallons. 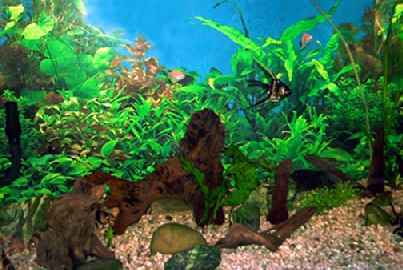 The Fish: 3 angels,5 clown loaches, 3 long finned gold tetras, 1 large pl*co, 1 polka dot catfish, 2 sae's, 2 rams, and 3 cories. Will be moving up in size when the clown loaches and angels start demanding more room. Comments: Nothing fancy, just 2 heaters, a fluval cannister filter, and a bubble wall for fun.